Sitting Bull (Lakota: Tȟatȟáŋka Íyotake in Standard Lakota Orthography, also nicknamed Slon-he or "Slow"; c. 1831 – December 15, 1890) was a Hunkpapa Lakota Sioux holy man who led his people as a tribal chief during years of resistance to United States government policies. He was killed by Indian agency police on the Standing Rock Indian Reservation during an attempt to arrest him at a time when authorities feared that he would join the Ghost Dance movement. Before the Battle of the Little Bighorn, Sitting Bull had a vision in which he saw the defeat of the 7th Cavalry under Lt. Col. George Armstrong Custer on June 25, 1876. Sitting Bull's leadership motivated his people to a major victory. Months after their victory at the battle, Sitting Bull and his group left the United States for Wood Mountain, Saskatchewan, where he remained until 1881, at which time he surrendered to U.S. forces. A small remnant of his band under Chief Waŋblí Ǧí decided to stay at Wood Mountain. After working as a performer, Sitting Bull returned to the Standing Rock Agency in South Dakota. Because of fears that he would use his influence to support the Ghost Dance movement, Indian Service agent James McLaughlin at Fort Yates ordered his arrest. During an ensuing struggle between Sitting Bull's followers and the agency police, Sitting Bull was shot in the side and head by Standing Rock policemen Lieutenant Bull Head (Tatankapah) and Red Tomahawk (Marcelus Chankpidutah) after the police were fired upon by Sitting Bull's supporters. His body was taken to nearby Fort Yates for burial, but in 1953, his remains were possibly exhumed and reburied near Mobridge, South Dakota, by his Lakota family, who wanted his body to be nearer to his birthplace. Sitting Bull was born in Dakota Territory. In 2007, Sitting Bull's great-grandson asserted from family oral tradition that Sitting Bull was born along the Yellowstone River, south of present-day Miles City, Montana. He was named Jumping Badger at birth. In traditional Lakota fashion, he was later given one of his father's names, Tȟatȟaŋka Iyotȟaŋka, translated as "Sitting Bull", due to a leadership role in a battle between the Lakota and Crow people. During the Dakota War of 1862, in which Sitting Bull's people were not involved, several bands of eastern Dakota (eastern Sioux) killed an estimated 300 to 800 settlers and soldiers in south-central Minnesota in response to poor treatment by the government and in an effort to drive the whites away. Despite being embroiled in the American Civil War, the United States Army retaliated in 1863 and 1864, even against bands which had not been involved in the hostilities. In 1864, two brigades of about 2200 soldiers under Brigadier General Alfred Sully attacked a village. The defenders were led by Sitting Bull, Gall and Inkpaduta. The Sioux were driven out, but skirmishing continued into August. In September, Sitting Bull and about 100 Hunkpapa Sioux came across a small party near what is now Marmarth, North Dakota. They had been left behind by a wagon train commanded by Captain James L. Fisk to effect some repairs to an overturned wagon. When he led an attack, Sitting Bull was shot in the left hip by a soldier. The bullet exited out through the small of his back, and the wound was not too serious. Sitting Bull led numerous war parties against Fort Berthold, Fort Stevenson, and Fort Buford and their environs from 1865 through 1868. Although Red Cloud was a leader of the Oglala Sioux, his leadership and attacks against forts in the Powder River Country of Montana were supported by Sitting Bull's guerrilla attacks on emigrant parties and smaller forts throughout the upper Missouri River region. By early 1868, the U.S. government desired a peaceful settlement to Red Cloud's War. It agreed to Red Cloud's demands that Forts Phil Kearny and C.F. Smith be abandoned. Chief Gall of the Hunkpapas (among other representatives of the Hunkpapas, Blackfeet, and Yankton Sioux) signed a form of the Treaty of Fort Laramie on July 2, 1868 at Fort Rice (near Bismarck, North Dakota). Sitting Bull did not agree to the treaty. He continued his hit-and-run attacks on forts in the upper Missouri area throughout the late 1860s and early 1870s. The events of –1868 mark a historically debated period of Sitting Bull's life. According to historian Stanley Vestal, who conducted interviews with surviving Hunkpapa in 1930, Sitting Bull was made "Supreme Chief of the whole Sioux Nation" at this time. Later historians and ethnologists have refuted this concept of authority, as the Lakota society was highly decentralised. Lakota bands and their chiefs made individual decisions. For more details on this topic, see Great Sioux War of 1876. Sitting Bull's band of Hunkpapa continued to attack migrating parties and forts in the late 1860s. When in 1871 the Northern Pacific Railway conducted a survey for a route across the northern plains directly through Hunkpapa lands, it encountered stiff Sioux resistance. The same railway people returned the following year accompanied by federal troops. Sitting Bull and the Hunkpapa attacked the survey party, which was forced to turn back. In 1873, the military accompaniment for the surveyors was increased again, but Sitting Bull's forces resisted the survey "most vigorously." The Panic of 1873 forced the Northern Pacific Railway's backers (such as Jay Cooke) into bankruptcy. This halted construction of the railroad through Sioux territory. After the discovery and new wealth from gold in California, other men became interested in the potential for gold mining in the Black Hills. In 1874, Lt. Col. George Armstrong Custer led a military expedition from Fort Abraham Lincoln near Bismarck, to explore the Black Hills for gold and to determine a suitable location for a military fort in the Hills. Custer's announcement of gold in the Black Hills triggered the Black Hills Gold Rush. Tensions increased between the Sioux and European Americans' seeking to move into the Black Hills. Although Sitting Bull did not attack Custer's expedition in 1874, the US government was increasingly pressured to open the Black Hills to mining and settlement. It was alarmed at reports of Sioux depredations (encouraged by Sitting Bull). In November 1875, the government ordered all Sioux bands outside the Great Sioux Reservation to move onto the reservation, knowing full well that not all would comply. As of February 1, 1876, the Interior Department certified as "hostile" those bands who continued to live off the reservation. This certification allowed the military to pursue Sitting Bull and other Lakota bands as "hostiles". According to the historian Margot Liberty, many Lakota bands allied with the Cheyenne during the Plains Wars because they thought the other nation was under attack by the US. Given this connection, she suggests the major war should have been called "The Great Cheyenne War". Since 1860, the Northern Cheyenne had led several battles among the Plains Indians. Before 1876, the US Army had destroyed seven Cheyenne camps, more than those of any other nation. However, other historians such as Robert M. Utley and Jerome Greene also use Lakota oral testimony as the basis for their conclusions that the Lakota coalition, of which Sitting Bull was the ostensible head, was the primary target of the federal government's pacification campaign. For more details on this topic, see Battle of the Little Bighorn. After the January 1st ultimatum of 1876, when the US Army began to track down Sioux and others living off the reservation as hostiles, Native Americans gathered at Sitting Bull's camp. The chief took an active role in encouraging this "unity camp". He sent scouts to the reservations to recruit warriors, and told the Hunkpapa to share supplies with those Native Americans who joined them. An example of his generosity was Sitting Bull's taking care of Wooden Leg's Northern Cheyenne tribe. They had been impoverished by Captain Reynold's March 17, 1876 attack and fled to Sitting Bull's camp for safety. The Hunkpapa chief provided resources to sustain the new recruits. Over the course of the first half of 1876, Sitting Bull's camp continually expanded, as natives joined him for safety in numbers. His leadership had attracted the warriors and families of an extensive village, estimated at more than 10,000 people. Lt. Col. Custer came across this large camp on June 25, 1876. Sitting Bull did not take a direct military role in the ensuing battle; instead he acted as a spiritual chief and had performed the Sun Dance, in which he fasted and sacrificed over 100 pieces of flesh from his arms, a week prior to the attack. The Native Americans' victory celebrations were short-lived. Public shock and outrage at Custer's death and defeat, and the government's knowledge about the remaining Sioux, led them to assign thousands more soldiers to the area. Over the next year, the new American military forces pursued the Lakota, forcing many of the Native Americans to surrender. Sitting Bull refused to surrender and in May 1877 led his band across the border into Saskatchewan, Canada. He remained in exile for four years near Wood Mountain, refusing a pardon and the chance to return. When crossing the border into Saskatchewan, Sitting Bull was met by the Canadian Mounties of the region. During this meeting, James Morrow Walsh, commander of the North-West Mounted Police, explained to Sitting Bull that the Lakota were now on British soil and must obey British law. Walsh emphasized that he enforced the law equally and that every person in the territory had a right to justice. Walsh became an advocate for Sitting Bull and the two became good friends for the remainder of their lives. Also while in Canada Sitting Bull met with chief Crowfoot, who was a chief of the Blackfeet, long-time powerful enemies of the Lakota and Cheyenne. Sitting Bull wished to make peace with the Blackfeet Nation and Crowfoot. Being an advocate for peace himself, Crowfoot eagerly accepted the tobacco peace offering. Sitting Bull was so impressed by the Blackfeet chief that he named one of his sons after him. Sitting Bull and his men only stayed in Canada for 4 years. Due to the smaller size of the buffalo herds in Canada, Sitting Bull and his men found it difficult to find enough food to feed his people, who were starving and exhausted. Furthermore, due to Sitting Bull’s presence in the country, there had been a growth in tension between the Canadian and the United States governments. Before Sitting Bull left Saskatchewan, he may have visited Walsh for a final time and left a ceremonial headdress as a memento. Hunger and desperation eventually forced Sitting Bull, and 186 of his family and followers to return to the United States and surrender on July 19, 1881. Sitting Bull had his young son Crow Foot surrender his Winchester lever-action carbine to Major David H. Brotherton, commanding officer of Fort Buford in the parlor of the Commanding Officer's Quarters in a ceremony the next day. He told the 4 soldiers, 20 warriors and other guests in the small room, that he wished to regard the soldiers and the white race as friends but he wanted to know who would teach his son the new ways of the world. Two weeks later, after waiting in vain for other members of his tribe to follow him from Canada, the Army transferred Sitting Bull and his band to Fort Yates, the military post located adjacent to the Standing Rock Agency, which straddles the present-day boundary of North and South Dakota. Sitting Bull and his band of 186 people were kept separate from the other Hunkpapa gathered at the agency. Army officials were concerned that the famed chief would stir up trouble among the recently surrendered northern bands. On August 26, 1881, he was visited by the census taker William T. Selwyn, who counted twelve people in the Hunkpapa leader's immediate family. Forty-one families, totaling 195 people, were recorded in Sitting Bull's band. The military decided to transfer him and his band to Fort Randall, to be held as prisoners of war. Loaded onto a steamboat, the band of 172 people was sent down the Missouri River to Fort Randall (near present-day Pickstown, South Dakota on the southern border of the state). There they spent the next 20 months. They were allowed to return north to the Standing Rock Agency in May 1883. In 1885, Sitting Bull was allowed to leave the reservation to go Wild Westing with Buffalo Bill Cody’s Buffalo Bill's Wild West. He earned about $50 a week for riding once around the arena, where he was a popular attraction. Although it is rumored that he cursed his audiences in his native tongue during the show, the historian Utley contends that he did not. Historians have reported that Sitting Bull gave speeches about his desire for education for the young, and reconciling relations between the Sioux and whites. The historian Edward Lazarus wrote that Sitting Bull reportedly cursed his audience in Lakota in 1884, during an opening address celebrating the completion of the Northern Pacific Railway. During his participation with the Wild West show, Sitting Bull met Annie Oakley. He was so impressed with Oakley's skills with firearms that he offered $65 for a photographer to take a photo of the two together. The admiration and respect of was mutual. Oakley stated that Sitting Bull made a "great pet" of her. Over time, Sitting Bull's respect for the young sharpshooter grew. Oakley was quite modest in her attire, deeply respectful of others and had a remarkable stage persona despite being a woman who stood only five feet in height. Sitting Bull felt that she was "gifted" by supernatural means in order to shoot so accurately with both hands. As a result of his esteem, he adopted her as a daughter in 1884. He named her "Little Sure Shot"—a name that Oakley used throughout her career. Sitting Bull stayed with the show for four months before returning home. During that time, audiences began to consider him a celebrity and a romanticized warrior. He earned a small fortune by charging for his autograph and picture, although he often gave his money away to the homeless and beggars. "Wild scene", "Squaws death chant heard in every direction"
Sitting Bull returned to the Standing Rock Agency after working in Buffalo Bill's Wild West Show. In 1890, James McLaughlin, the U.S. Indian Agent at Fort Yates on Standing Rock Agency, feared that the Lakota leader was about to flee the reservation with the Ghost Dancers, so he ordered the police to arrest him. On December 14, 1890, McLaughlin drafted a letter to Lt. Henry Bullhead that included instructions and a plan to capture the chief. The plan called for the arrest to take place at dawn on December 15, and advised the use of a light spring wagon to facilitate the chief's removal before his followers could rally. Bullhead decided against using the wagon. He intended to have the police officers force Sitting Bull to mount a horse immediately after the arrest. Around 5:30 a.m. on December 15, 39 police officers and four volunteers approached Sitting Bull's house. They surrounded the house, knocked and entered. Bullhead told Sitting Bull that he was under arrest and led him outside. The camp awakened and men converged at the house of their chief. As Bullhead ordered Sitting Bull to mount a horse, he explained that the Indian Affairs agent needed to see him and then he could return to his house. Sitting Bull refused to comply and the police used force on him. The Sioux in the village were enraged. A Sioux known as Catch-the-Bear shouldered his rifle and shot Bullhead who, in return, fired his revolver into the chest of Sitting Bull. Another police officer, Red Tomahawk, shot Sitting Bull in the head, and the chief dropped to the ground. He died between 12 and 1 p.m.
A close-quarters fight erupted, and within minutes several men were dead. Six policemen were killed immediately and two more died shortly after the fight. Sitting Bull and seven of his supporters lay dead, along with two horses. Sitting Bull's body was taken to Fort Yates to be placed in a coffin (made by the Army carpenter) and for burial. In 1953 Lakota family members exhumed what they believed to be his remains, to be reinterred near Mobridge, South Dakota, his birthplace. Following Sitting Bull's death, his cabin on the Grand River was taken to Chicago to become an exhibit at the 1893 World's Columbian Exposition. Native American dancers also performed at the Exposition. The American historian Gary Clayton Anderson of the University of Oklahoma published Sitting Bull and the Paradox of Lakota Nationhood a revisionist examination of the Lakota medicine man. Anderson stresses the Little Big Horn not so much as a mishap by Custer but in light of past succeses the Lakota Nation and the merits of Sitting Bull himself. In August 2010, a research team led by Eske Willerslev, an ancient DNA expert at the University of Copenhagen, announced their intention to sequence the genome of Sitting Bull, with the approval of his descendents using a hair sample obtained during his lifetime. ↑ Encyclopædia Britannica. 20. 1955. p. 723. ↑ Kehoe, Alice (2006). The Ghost Dance. Long Grove, IL: Waveland Press, Inc.. ISBN 1577664531. ↑ 4.0 4.1 4.2 "PBS: The West: Sitting Bull". http://www.pbs.org/weta/thewest/people/s_z/sittingbull.htm. ↑ Utley, Robert (2008). Sitting Bull: The Life and Times of an American Patriot. Holt Paperbacks. p. 22. ISBN 978-0805088304. ↑ Blumberg, Jess (2007-10-31). "Sitting Bull's Legacy". Smithsonian. http://www.smithsonianmag.com/specialsections/heritage/200711-sittingbull.html?c=y&page=3. Retrieved 2011-10-04. ↑ United States History: Sitting Bull. ↑ 8.0 8.1 8.2 "The US Army and the Sioux". National Park Service. http://www.nps.gov/thro/historyculture/the-us-army-and-the-sioux.htm. Retrieved February 19, 2011. ↑ Vestal, Stanley (1989). Sitting Bull, Champion of the Sioux: A Biography. University of Oklahoma Press. p. 63. ISBN 0-8061-2219-6. http://books.google.ca/books?id=QvrzJJcUNsUC&pg=PA64&lpg=PA64&dq=Sitting+Bull+1864#v=onepage&q=Sitting%20Bull%201864&f=false. Retrieved February 19, 2011. ↑ Utley 1993, pp. 66–72. ↑ Utley 1993, p. 80. ↑ Utley 1993, p. 82. ↑ Utley 1993, p. 88-89. ↑ Utley, Frontier Regulars 1973, p. 242. ↑ Bailey 1979, pp. 84–5. ↑ Utley Frontier Regulars 1973, p. 242. ↑ Utley Frontier Regulars 1973, p. 244. ↑ Bailey 1979, pp. 106–7. ↑ Utley Frontier Regulars 1973, p. 248. ↑ 20.0 20.1 20.2 Liberty, Dr. Margot. "Cheyenne Primacy: The Tribes' Perspective As Opposed To That Of The United States Army; A Possible Alternative To "The Great Sioux War Of 1876"". Friends of the Little Bighorn. http://www.friendslittlebighorn.com/cheyenneprimacy.htm. Retrieved 13 January 2008. ↑ Utley, Robert M. (1993). Sitting Bull: The Life and Times of an American Patriot. New York, New York: Henry Holt&Co.. pp. 88, 122. ISBN 0-8050-8830-X. ↑ Greene, Jerome (1993). Battles and Skirmishes of the Great Sioux War, 1876–77: The Military View. Norman, OK: University of Oklahoma Press. pp. xvi, xvii. ISBN 0-8061-2535-7. ↑ Greene, Jerome (1994). Lakota and Cheyenne: Indian Views of the Great Sioux War, 1876–1877. Norman, OK: University of Oklahoma Press. p. xv. ISBN 0-8061-3245-0. ↑ Powers, Thomas. "How the Battle of Little Bighorn Was Won". Smithsonian.com. 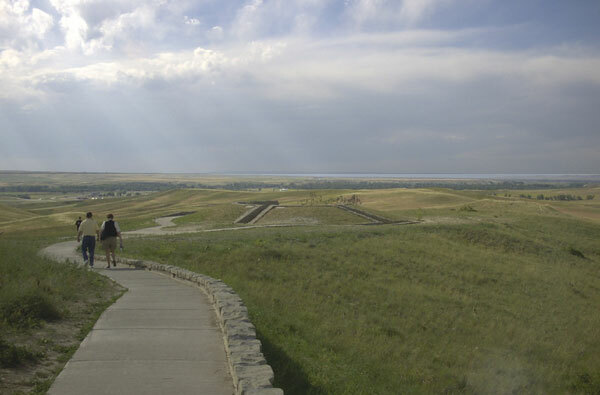 http://www.smithsonianmag.com/history-archaeology/How-the-Battle-of-Little-Bighorn-Was-Won.html. ↑ Wood Mountain, Saskatchewan official site. ↑ Ephriam D. Dickson III, The Sitting Bull Surrender Census: The Lakotas at Standing Rock Agency, 1881, Pierre: South Dakota State Historical Society Press, 2010, pp. 23–33. ↑ Utley 1993, p. 263. ↑ Standing Bear 1975, p. 185. ↑ Lazarus 1991, p. 106. ↑ Utley 1993, p. 264. ↑ Whittaker, A Complete Life of General Custer, Volume 2, p. 535. ↑ "Sitting Bull becomes a Catholic". New York Times. 1883-04-13. http://query.nytimes.com/mem/archive-free/pdf?res=F10811F83E5411738DDDAA0994DC405B8384F0D3. Retrieved 2011-04-11. ↑ Chicago Daily Tribune, May 26, 1883, 8. ↑ Nichols, Roger L.; University of Oklahoma (2003). "American Indians in U.S. History". Norman Press. p. 160. ↑ Utley, Robert M. (2004). "The Last Days of the Sioux Nation, 2nd Edition". Yale University Press. p. 155,157. ↑ Utley, Robert M. (2004). "The Last Days of the Sioux Nation, 2nd Edition". Yale University Press. p. 158. ↑ Utley, Robert M. (2004). "The Last Days of the Sioux Nation, 2nd Edition". Yale University Press. p. 160. ↑ Dippie, Brian W. The Vanishing American: White Attitudes and U.S. Indian Policy. Middleton, Conn.: Wesleyan University Press, 1982. ↑ Snider, G.L., A Maker of Shavings, the life of Edward Forte, formerly 1st Sergeant, troop "D", 7th Cavalry 1936. ↑ "Bones of Sitting Bull Go South From One Dakota to the Other.". Associated Press in The New York Times. April 9, 1953. http://select.nytimes.com/gst/abstract.html?res=FA0D15F63E55107B93CBA9178FD85F478585F9. Retrieved 2008-05-29. "A group of South Dakotans today lifted the bones of Sitting Bull, famed Sioux Indian medicine man, from the North Dakota burial ground in which they had been buried sixty-three years and reburied them across the state line in South Dakota near the Chief's boyhood home." ↑ Barry, Dan (January 28, 2007). "Restoring Dignity to Sitting Bull, Wherever He Is". New York Times. http://select.nytimes.com/2007/01/28/us/28thisland.html. Retrieved 2008-05-29. "Then, in 1953, some Chamber of Commerce types from the small South Dakota city of Mobridge executed a startling plan. With the blessing of a few of Sitting Bull’s descendants, they crossed into North Dakota after midnight and exhumed what they believed were Sitting Bull’s remains." ↑ Barker 1994, p. 165. ↑ United States Postal Service, Postal History Web site. ↑ Sitting Bull and the Paradox of Lakota Nationhood. Prentice Hall, ISBN 978-0-321-42192-0. http://www.indiaplaza.in/sitting-bull-paradox-of-lakota-nationhood-anderson-gary-clayton/books/9780321421920.htm. Retrieved October 23, 2010. ↑ "Sid Meier's Civilization IV". IGN Entertainment. http://pc.ign.com/articles/654/654463p1.html. .
↑ James White. Barack Obama names Sitting Bull as inspirational American in new children's book. Mail Online (Posted: November 17, 2010). ↑ Genome of a chief, Science News, Web edition: Tuesday, August 17th, 2010. Bailey, John W. Pacifying the Plains: General Alfred Terry and the Decline of the Sioux, 1866–1890. Westport, Conn.: Greenwood Press, 1979. Barker, Barbara. "Imre Kiralfy's Patriotic Spectacles: "Columbus, and the Discovery of America" (1892–1893) and "America" (1893)." Dance Chronicle. Vol. 17, no. 2 (1994). McLaughlin, James. Account of the Death of Sitting Bull and of the Circumstances Attending It. Philadelphia, 1891. Mooney, James. (Abridged version) The Ghost-Dance Religion and the Sioux Outbreak of 1890. Originally published as Part 2 of the Fourteenth Annual Report of the Bureau of Ethnology to the Secretary of the Smithsonian Institution, 1892–93, Washington: GPO, 1896. Abridged version publication information: Edited by Anthony F. C. Wallace. Chicago: University of Chicago Press, 1965. "Sitting Bull Rises Again – Two Indians Deny Bones of Chief Were Taken to South Dakota." The New York Times. December 19, 1953. Prairie Public Radio. Dakota Datebook. September 3, 2004. United States Postal Service, Postal Service Listing of American Indian Stamps. Utley, Robert M. The Lance and the Shield: The Life and Times of Sitting Bull. 1st ed. New York: Henry Holt and Company, 1993. Utley, Robert M. Frontier Regulars: The United States Army and the Indian, 1866–1891. New York: Macmillan Publishers, 1973. Standing Bear, Luther. (Reprint) My People the Sioux. Lincoln: University of Nebraska Press, 1975. Ullrich, Jan New Lakota Dictionary. Lakota Language Consortium, 2008. Adams, Alexander B. Sitting Bull: An Epic of the Plains. New York: G. P. Putnam's Sons, 1973. DeWall, Robb. The Saga of Sitting Bull's Bones: The Unusual Story Behind Sculptor Korczak Ziolkowski's Memorial to Chief Sitting Bull. Crazy Horse, S.D. : Korczak's Heritage, 1984. Greene, Jerome A., ed. Lakota and Cheyenne: Indian Views of the Great Sioux War, 1876–1877. Norman, Okla.: University of Oklahoma Press, 1994. Manzione, Joseph. "I Am Looking to the North for My Life": Sitting Bull: 1876–1881. Salt Lake City: University of Utah Press, 1991. Newson, Thomas McLean. Thrilling scenes among the Indians, with a graphic description of Custer's last fight with Sitting Bull. Chicago: Belford, Clarke and Co., 1884. "Confirmation of the Disaster." The New York Times. July 7, 1876. "The Death of Sitting Bull." The New York Times. December 17, 1890. "The Last of Sitting Bull." The New York Times. December 16, 1890. Reno, Marcus Albert. The official record of a court of inquiry convened at Chicago, Illinois, January 13, 1879, by the President of the United States upon the request of Major Marcus A. Reno, 7th U.S. Cavalry, to investigate his conduct at the Battle of the Little Big Horn, June 25–26, 1876. (Reprint online) Pacific Palisades, Calif.: 1951. Sifakis, Stewart. Who's Who In The Civil War. New York: Facts on File Publishing, 1988. Yenne, Bill. "Sitting Bull." Yardley, PA: Westholme, 2008. Wikimedia Commons has media related to Sitting Bull. Wikisource has the text of the 1911 Encyclopædia Britannica article Sitting Bull. American Public Media Speaking of Faith interview of Ernie LaPointe entitled "Tatanaka Iyotake: Reimagining Sitting Bull"
Kuzriel Meir (Jan 01, 2001). "Sitting Bull". Sioux Indian Leader. Find a Grave. http://www.findagrave.com/memorial/955. Retrieved Aug 18, 2011.